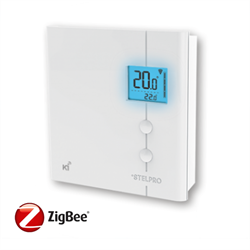 The Stelpro STZB402+ is a Zigbee Automation line level thermostat directly supporting 120V and 240V baseboard heaters and convectors. The STZB402+ is compatible with automation controller that supports Zigbee HA including Vera, Leviton, Smartthings and more. When used with a Zigbee automation controller, users can experience enhanced convenience and energy savings by adding remote control and scheduling as well as event automation to turn down heat when the space isn't occupied. These routines, schedules and triggers are controlled by the Zigbee automation hub. This new version supports baseboard heaters with and without fans, and in addition to controlling temperature, it may be turned OFF completely. Temperature range 5 to 30C, 41 to 86F - and OFF. Note: The thermostat requires a Zigbee automation controller to enable automation and scheduling. It does not have built-in scheduling. Not compatible with WINK 2 hub.